Tessa Thompson's style is unpredictable because she knows how to switch things up which is a good thing. She was on hand for the 2018 MTV Movie & TV Awards yesterday evening(June 16th) at the Barker Hanger in Santa Monica, CA. 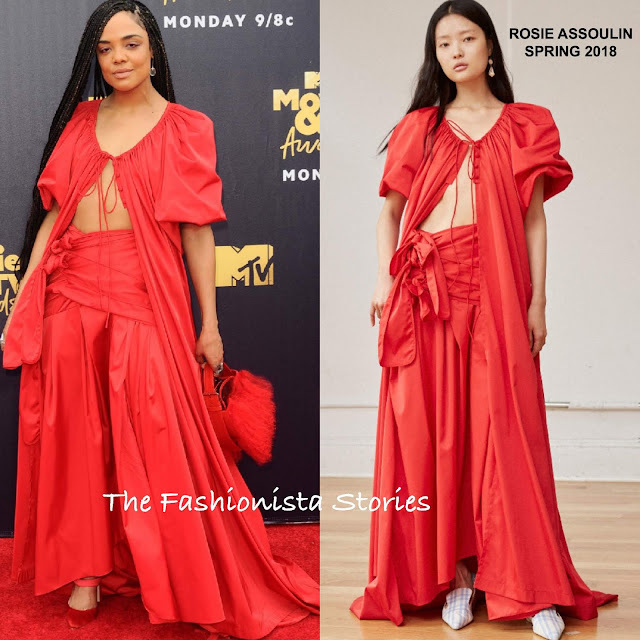 On tune with the red carpet, she wore a ROSIE ASSOULIN SPRING 2018 red short sleeve coat dress with a tie detail and the matching tri-tie, high waist skirt with a wrap-effect. While I do not favor her matching red STUART WEITZMAN pumps, I still thought this was a great look. Also I am loving her braids. EFFY & MELINDA MARIA jewelry and a feather bag finished up her look.